Here’s one ingredient to add to the perfect recipe for getting swept against the last world champions of baseball you can stomach, the Houston Astros. You take Luis Severino out of the equation and then replace him with a prospect who went from AA to the MLB. Once he is inserted in that position, have the prospect go three innings in the middle game against a stacked Astros lineup and watch your bullpen be overworked. The reality here is, it just wasn’t sustainable to have Jonathon Loaisiga out there every five days. It doesn’t mean he doesn’t have all-world talent. It just means that Sevy is irreplaceable. Remember what Sevy did last year against Houston? He went into their castle and treated the champions of baseball like he would a Dominican Winter League team. Unfortunately, for this series, we didn’t see another potential Sevy vs. Houston gem. 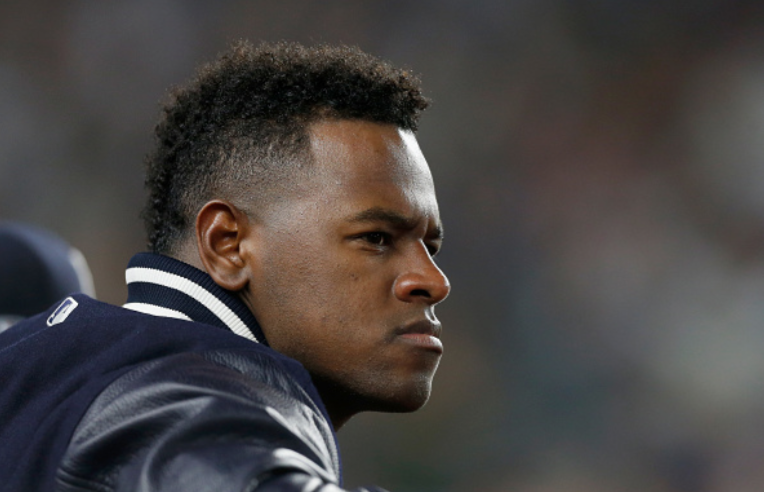 Tuesday night we found out some bad Luis Severino news. He’s going to be out for at least another six weeks. This according to Coley Harvey of ESPN. 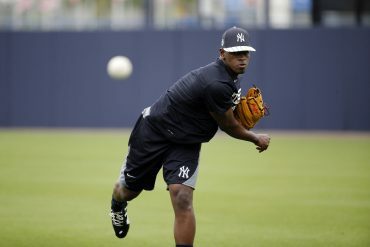 Luis Severino has a Grade-2 right lat strain after his MRI today, Yankees say. He’ll be shut down (no throwing) for six weeks. This was an injury not found on the original MRI. Since this injury didn’t appear on the original MRI, it may have occurred during his throwing program. We’re already seeing the early effects of not having your ace be a stopper, and the longer this goes on, the worse it’ll be. 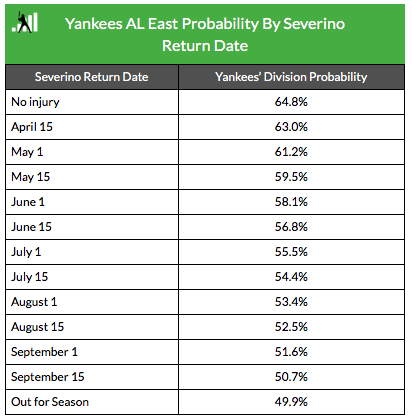 Back in March, Dan Szymborski of Fangraphs wrote a great blog of what an injury to Luis Severino means to the Yankees. What you’ll see from the ZiPS projections he cited, losing Sevy will have a significant effect on the Bombers. Now it’s just a matter of who will be attempt to replace a percentage of what Sevy brings to the table. As it stands, that person is not Johnny Lasagna. He will have to take his reps in the minors. Now let’s say Sevy is out for the rest of the year because something else pops up after those six weeks. If there’s one thing we learned about this off-season and the Yankees’ supposed preference of Nolan Arenado over Manny Machado, you can’t factor outside options as solutions. This is why, when you throw out a name like Madison Bumgarner as a potential replacement, while it is possible, a trade like that should be placed under the “unlikely” category for a few reasons. One, it’s extension season. It’s true that MadBum isn’t what he once was but right now, money is being thrown around. He could be given an extension at some point before the deadline. Sure, it’s a dumb move, but don’t ever count out an owner’s need to sell merchandise because the wins aren’t there. Two, teams know the Yankees are desperate for a starter. Someone with much more to lose in their season might be willing to go the extra distance in terms of prospects to anchor a trade like that down. You have to think that Miguel Andujar and Estevan Florial are off the table for MadBum – as they should be too. The equivalent of those guys though on, let’s say the Phillies, might not be. Take a look at the track record of a guy like Dave Dombrowski. This is a guy who is really good at making bad longterm decisions after success. If/when the Red Sox rebound, it wouldn’t be shocking to me if he just threw their top prospect Michael Chavis at the Giants in order to, not only help their rotation for 2019, but steal him from the Yankees. Now let’s say the Yankees were able to pry MadBum from the Giants. 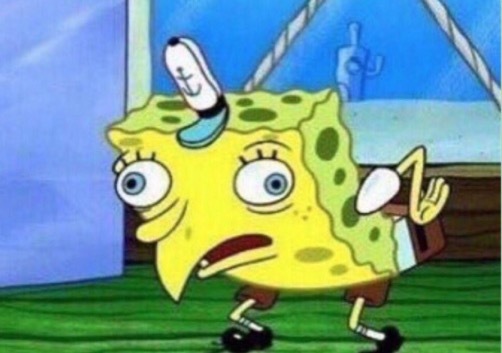 It still doesn’t mean they’re in the clear and have the perfect replacement for Sevy. They won’t be getting 2014 Bumgarner. They’ll be getting a guy who has clearly logged in a lot of innings in his career and that is taking a toll on him. 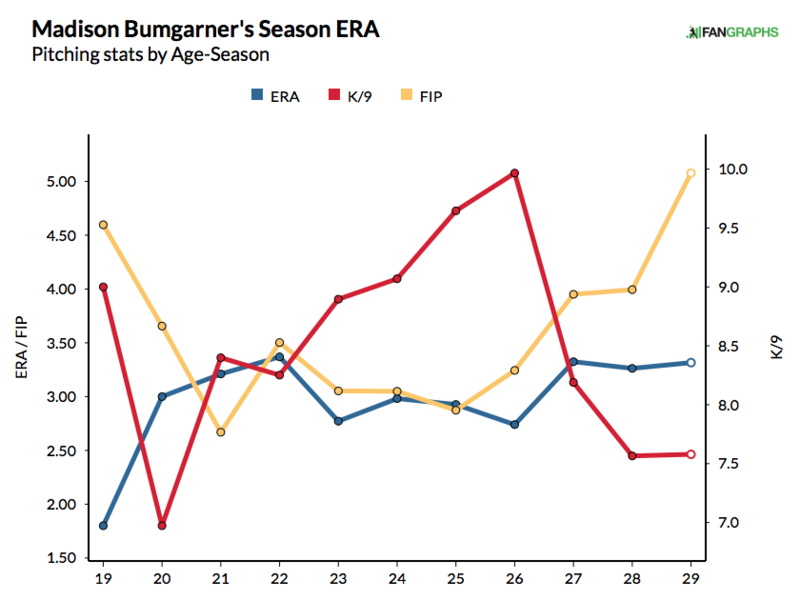 At this point, if you take a look at this chart from Fangraphs, his ERA and FIP are trending upwards as he gets older and his K’s/9 are plummeting. This should be a cause for concern. Especially since, to get this guy, Brian Cashman might end up giving away some highly regarded talent in the farm system. Maybe not Florial, but a Josh Stowers, Roansy Contreras, Thairo Estrada or Osiel Rodriguez. Maybe you haven’t heard of them now, but when MadBum is doing an even worse Chris-Sale-Velocity-In-The-Trash impression for the 2022 Kansas City Royals, you might then. The other option on the table is Dallas Keuchel. Even with the data here, if I was sitting in a Yahoo Fantasy Draft room and I needed a starter and my options were MadBum and Keuchel, well, I’m going MadBum. There’s a chance he pulls a Justin Verlander and transforms into a stud again after a trade. The one thing about Keuchel, though, is that all he will cost is money. You won’t have to dump away the future of your team for him. It’s true that this is a tall asking price for a guy who won’t be ready for another month even if they ink him to a deal tomorrow. That to me though sounds less like a fan’s issue and more like a Hal Steinbrenner problem. I personally don’t give a damn how much the Yankees spend. They can have a $300 million payroll and that would do nothing for me. 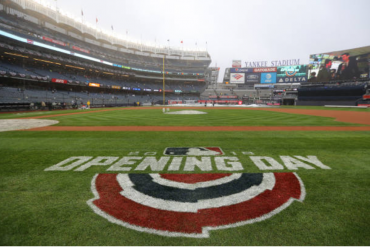 I would go about my day just fine – and after watching the Yankees’ profits increase over the years, it seems like they’ll have no problem either. 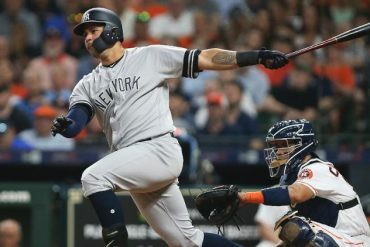 A new report from Forbes says the Yankees are the most valuable team in Major League Baseball. They are worth an estimated $4.6 billion, which is a 15 percent increase from last year. That is double the average worth of any other team in the MLB. This isn’t shocking at all either. The Yankees are a worldwide brand. This year when I went to Paris, the entire Gucci storefront was dedicated to overpriced Yankees merch. During this same trip, I saw at least one Yankee hat a day. Whether they be tourists or somebody who sees the Yankee brand as a symbol of Americana, the Yankees have their arms all over the world and anybody with that pull has the money to foot a Keuchel bill for a year. Unfortunately, they’ve conditioned a lot of us to believe they are better served as penny pinchers. Signing Keuchel would just be a one year deal – not five or six. It wouldn’t make the team feel financially stifled the way a Patrick Corbin deal could have gone if they signed him longterm. You’d have to think he would also be ready a little before they could realistically acquire a MadBum at the trade deadline. On top of this, you don’t have to lose young talent for him. (You do lose a draft pick but the Yankees did get one from the Reds during the Sonny Gray deal.) 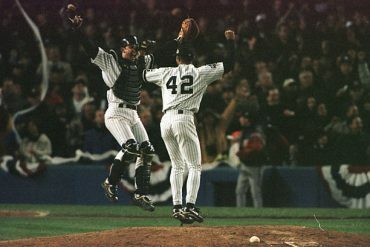 While the Steinbrenner bottom line means nothing to me, the Yankees winning and losing is everything. A Yankee win effects my mood – and the mood of a lot of us. 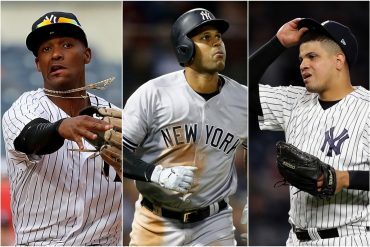 You lose young talent, in the future when you have to plug holes and can’t simply buy players on the market because they’re all signed to extensions, the chances of the Yankees losing increases. That means my mood will be in the dumps. I don’t want that. Nobody does. This is why, if Hal has to throw a few dollars at Dallas Keuchel and is going to have to be relegated to the mid-tier membership plan at the Snotty People’s Deluxe Golf Course located in an undisclosed location somewhere in Tampa, I’m okay with that. 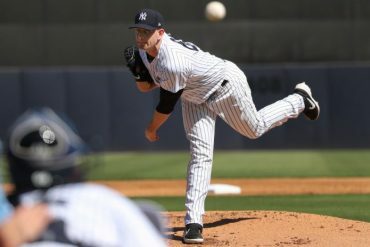 If they trade Stowers and he becomes a stud, how am I going to sarcastically gloat that Cashman magically turned 2018’s armpit Sonny Gray into a beast? All the Yankees can hope for right now is that the Red Sox stay where they are. As we scramble back into good health, a Boston resurgence and them reintroducing themselves to the league the way Voldemort’s Death Eater’s did when they flashed the Dark Mark in the sky during the Quidditch World Cup, could mean another devastating year where we’re chasing them. The quicker they figure something out the better.